Located on Duke University’s West Campus, Duke University Chapel is as magnificent in structure as it is rich in ministry. Construction of the Chapel was begun in October of 1930 and completed two years later. During that time students continually congregated at the stonemasons’ huts to watch the Chapel take shape. 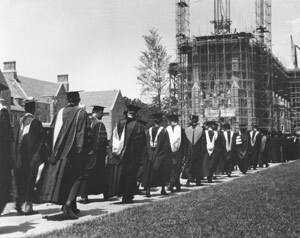 It was first used for Commencement in 1932 and was formally dedicated on June 2, 1935. Duke Chapel continues to be a Christian church of uniquely interdenominational character and purpose. Through its tradition of inspiring worship and music, and a calling to walk with people of all faiths and circumstances, Duke Chapel stands as a beacon of hope on campus and in the community that bridges faith and learning.